I have cats on my mind. I know part of the reason is because of the book I wrote, Your Cat: The Owner's Manual . But mostly I’m thinking about last month’s Christmas Pawty, when my daughter, Vetstreet pet trainer Mikkel Becker, went with me to our area shelters to bring attention to those pets who’d been waiting the longest for their forever homes. The dog we’d first chosen was adopted before we could feature him. Our next choice for a dog was immediately snapped up. But the cat? Sweet Idaho kept waiting … and is waiting still. This spring I will be talking about cats a great deal — again, because of the new book — but I would like to get a jump on that by getting you to talk about cats. Better still, I would like to get you to adopt one — the sooner the better. I know that going to a shelter can be a little overwhelming — all those cats needing homes, and you with room for only one or two at most. But if you think about what you’re looking for in a cat, go into the shelter with a plan and listen to your head and your heart, I bet you’ll find the adoption option is easier and more rewarding than you think. There are advantages to adopting from a shelter, and saving money is one of them. Adult pets are usually spayed or neutered before they’re made available for adoption, and that’s a savings right there. The cats you see at the shelter have also usually been vet-checked, vaccinated and, in some shelters, evaluated for temperament before you meet them. In many shelters you’ll find staff members and volunteers who are familiar with each cat’s personality and can tell you which are lap-sitters, which are playful, which like kids and dogs, and which would prefer adults. Another plus to the shelter is the variety of cats you can find: Longhaired, shorthaired, tabby, calico and sometimes even pedigreed cats, especially popular breeds such as Siamese and Persian. 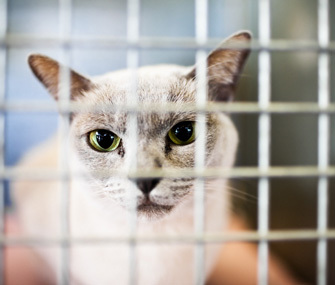 Yes, that’s right: If you’ve always dreamed of having a chatty Siamese, you may be able to find one in a shelter, especially if you broaden your search by using Petfinder. Want more reasons to adopt from a shelter? Many shelter cats are already familiar with home life, because that's where they came from, often ending up in a shelter through no fault of their own — especially in this economy. They may be cool around kids or dogs, and they probably know the litter box routine. I’m no fan of declawing, but if you believe you must have a cat who is declawed, there’s a good chance you can find one at a shelter. I’d rather see you adopt a cat who has already been declawed if that's what you want — and they're out there! Before you go to the shelter, get a picture in your head of what you want in a cat. Lap-sitter or lively? Outgoing or introverted? Chatty or quiet? Some shelters start with adoption counseling first, then introduce you to the cats who are the best matches. Other shelters give you a chance to look the cats over and visit with them first, then help you choose the one cat who’s right for you. At a shelter that doesn’t offer adoption counseling? Look beyond the cute and think of the home you’re providing. If yours is a three-ring circus with boisterous children and lots of other animals, you’ll want to consider those bold, friendly cats who seem to be handling the shelter environment well. If you have a quiet home, look to the shy cats who may just need time to relax and look around in a new home. That cat can also be a good choice if you enjoy the feline presence but would prefer not to have one who’s “in your face” all the time. Most important, look past appearance and "see" with your heart what's really there. Behind the plain-vanilla exterior of a cat who has been overlooked by many, you may discover a sweet pet with the perfect personality. Those cats are the keepers, no matter what they look like. Which leads me to the best reason of all for adopting a cat from a shelter: that warm, fuzzy, tingly glow you get from giving a home to a cat in need and hearing him purr as he settles into his new digs — after you get your veterinarian to check him over, of course!